Although the ‘Choose Your Adventure’ style of gamebooks had been around by the time The Warlock of Firetop Mountain was published in 1982, the first Fighting Fantasy title was groundbreaking. It allowed gamers to play in their own time, complete with a solid set of rules so that it felt like a roleplaying adventure, and the success of the series meant the adventures were readily available in bookshops and high street shops rather than in just speciality shops. In comparison, the Endless Quest series, published by TSR, Inc. were no match, for whilst their stories took place in the worlds of the publisher’s various settings, they were all text, did not come with any mechanics, and so did not feel like a game. TSR, Inc. published two series of the books and its successor, Wizards of the Coast also published its own beginning in 2008. Now the publisher has returned to the series with a new quartet of titles, all tied with Dungeons & Dragons and all set in its default setting of Faerûn in the Forgotten Realms. Written by Matt Forbeck—best known as the designer of the roleplaying game, Brave New World—each of the quartet focuses upon a core Class and a core Race found in Dungeons & Dragons. So there is a title involving a Cleric, a Fighter, a Rogue, and a Wizard and a title involving a Dwarf, an Elf, a Halfling, and a Human. These are combined into the classic pairings found in Dungeons & Dragons, Fifth Edition, so the four books in turn tell of the adventures of a Dwarf Cleric, an Elf Wizard, a Halfling Rogue, and a Human Fighter. Each comes as a sturdy little hardback, illustrated in full colour with artwork drawn from the current version of Dungeons & Dragons, including lots and lots of monsters. Each book contains some sixty or so entries and is written for a young teenage audience, so they are suitable for those coming to Dungeons & Dragons for the first time. This does not mean that there is nothing of interest for veteran players of Dungeons & Dragons to be found in the pages of these solo adventures. Being set above, below, and across Faerûn, the protagonists of each book will have the opportunity to visit various locations familiar from both the novels set in the Forgotten Realms and the game supplements too. Having explored the adventures of the Human Fighter in the underworld in Escape the Underdark and the adventures of a Dwarf Cleric in Into the Jungle, you follow the adventures of a Halfling Rogue in To Catch a Thief. As the protagonist, you are an independent thief working the streets of the city of Waterdeep, but tonight you have overreached yourself and attempted to pick the pocket of Laeral Silverhand, the Open Lord of Waterdeep. Caught red handed, you are given a choice. One is to suffer the consequences of your actions and be thrown into gaol, the other is to undertake a difficult and probably dangerous task for Laeral Silverhand. This is to recover a baby griffon which has been stolen from her and not just by any thief. No, the thief in question is the Xanathar, the leader of the city’s powerful Thieves’ Guild, and right now, the Xanathar just happens to be none other than a Beholder! To Catch a Thief sets up an entertaining challenge, one that is played out over what will be familiar territory to many a fan of the Forgotten Realms. They will recognise various locations around Waterdeep, notably the Yawning Portal Inn and likewise, the teeming hive of evil that is the Port of Shadows which lies below the city in Undermountain. There are encounters too with some of the famous inhabitants of Waterdeep, plus a very cleverly done encounter with the most famous figure in the Forgotten Realms. Thus, To Catch a Thief is tied in with a pair of books for Dungeons & Dragons, Fifth Edition. One is Tales from the Yawning Portal, the other is the more recent Waterdeep: Dragon Heist, but then given the wealth of support for the Forgotten Realms setting over the years, To Catch a Thief is full of nods to lots of books. Of course, before our Halfling Rogue gets to rush off and search for the Xanathar and the missing Griffon, there is a decision to be made—will she do the task or not? A good part of the first half of the book is devoted to her doing other things in order to avoid doing the job. This leads to the happy-go-lucky protagonist of To Catch a Thief doing a lot of running around and giving her prospective ‘employers’ a great deal of run around, which for the most part, results in her wriggling out of her newly acquired task and leaving Waterdeep. 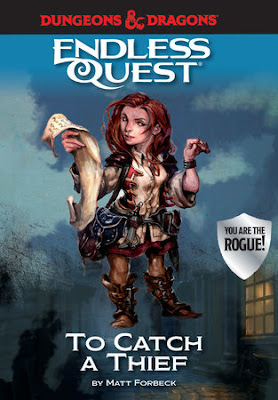 Which feels perfectly in keeping with the roguish nature of the character and story and which actually feels different to the previously reviewed new Endless Quest titles where there is a greater chance of the protagonist meeting an unfortunate end. This is not to say that she never dies in To Catch a Thief, it is just not as frequent. Once the reader and the Halfling Rogue decide to undertake the task, the action switches as you attempt to find out where Xanathar might be holding the stolen baby griffon and how to get there. The trail leads downwards and will see the protagonist running into pirates, slavers, and worse. Getting back out thankfully, is not as challenging as getting in and there are some enjoyable scenes with the baby griffon along the way. In general, To Catch a Thief is tonally not as grim as either Escape the Underworld or Into the Jungle. This is not to say that it avoids dealing with grim subjects, where the tone of Into the Jungle was Dwarven and dour, this is much lighter, reflecting the happiness of Halfings and the devil may care attitude of the Rogue Class. As a Rogue, the protagonist is never portrayed as being totally amoral or lacking in conscience, though the later may take a nudge or two to actually work! One issue with To Catch a Thief—and thus the Endless Quest series—is the lack of replay value. Once read through, the lack of variability that a set of rules or mechanics, means that there is no longer the challenge to be found in the book and thus a strong issue to read it again. To be fair, mechanics or rules were never a feature of the Endless Quest series and so there is no expectation that they should be in this new series. Just that in comparison with other solo adventures, they are not as sophisticated and so are suited to a younger audience. To Catch a Thief joins Escape the Underdark in being quite familiar in terms of its settings, Waterdeep being one of the most visited cities in fantasy roleplaying and fantasy fiction. The familiarity means that the older reader will get a strong sense of nostalgia from this solo adventure, whilst for anyone new to the Forgotten Realms it serves as a good introduction—to Waterdeep in particular, as well as perhaps, inspiration for when they get to the gaming table and play Dungeons & Dragons for real.